waveform = wlanWaveformGenerator(bits,cfgFormat) generates a waveform for the specified information bits, and format configuration. For more information, see IEEE 802.11 PPDU Format. waveform = wlanWaveformGenerator(bits,cfgFormat,Name,Value) overrides default generator configuration values using one or more Name,Value pair arguments. Generate a time-domain signal for an 802.11ac VHT transmission with one packet. Create the format configuration object, vht. Assign two transmit antennas and two spatial streams, and disable STBC. Set the MCS to 1, which assigns QPSK modulation and a 1/2 rate coding scheme per the 802.11 standard. Set the number of bytes in the A-MPDU pre-EOF padding, APEPLength, to 1024. Generate a full bandwidth HE MU-MIMO configuration at 20MHz bandwidth with SIGB compression. All three users are on a single content channel, which includes only the user field bits. Create PSDU data for all users. Generate and plot the waveform. Generate a full bandwidth HE MU-MIMO waveform at 80MHz bandwidth with SIGB compression. HE-SIG-B content channel 1 has four users. HE-SIG-B content channel 2 has three users. Generate a full bandwidth HE MU-MIMO configuration at 20MHz bandwidth without SIGB compression. All three users are on a single content channel, which includes both common and user field bits. Generate an 80 MHz HE-MU waveform for six users without SIGB compression. HE-SIG-B content channel 1 has four users. HE-SIG-B content channel 2 has two users. Generate a full bandwidth HE MU-MIMO waveform at 80MHz bandwidth without SIGB compression. HE-SIG-B content channel 1 has seven users. HE-SIG-B content channel 2 has no users. Configure wlanWaveformGenerator to produce a time-domain signal for an 802.11ac VHT transmission with five packets and a 30 microsecond idle period between packet. Use a random scrambler initial state for each packet. Create a VHT configuration object and confirm the channel bandwidth for scaling the x-axis of the plot. Generate and plot the waveform. Display the time in microseconds on the x-axis. 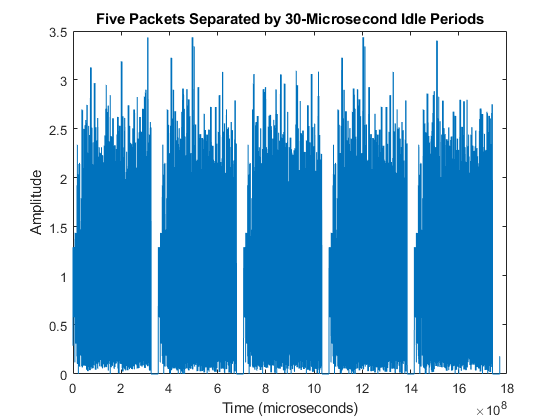 Five packets separated by 30 microsecond idle periods. Information bits for a single user, including any MAC padding representing multiple concatenated PSDUs, specified as a binary vector stream. Internally, the input bits vector is looped as required to generate the specified number of packets. The property cfgFormat.PSDULength specifies the number of data bits taken from the bit stream for each transmission packet generated. The property NumPackets specifies the number of packets to generate. When bits is a cell array, each element of the cell array must be a double or int8 typed binary vector. When bits is a vector or scalar cell array, the specified bits apply to all users. The data rate and PSDU length of generated PPDUs is determined based on the properties of the packet format configuration object. 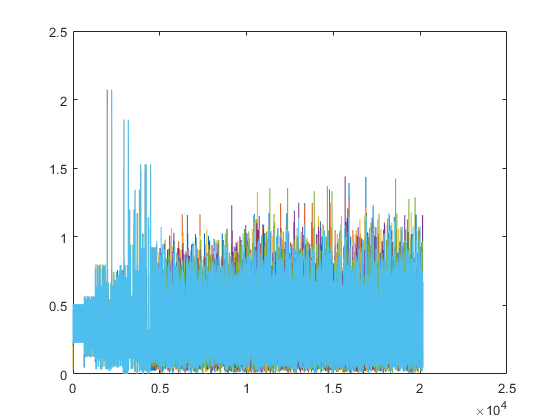 Number of packets to generate in a single function call, specified as a positive integer. Initial scrambler state of the data scrambler for each packet generated, specified as an integer from 1 to 127, or as an NP-by-NUsers matrix of integers with values from 1 to 127. 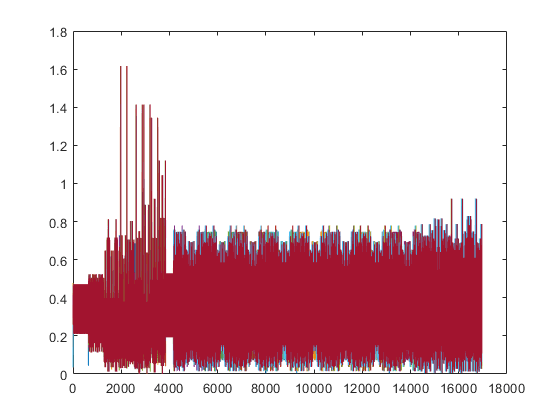 NP is the number of packets, and NUsers is the number of users. The default value of 93 is the example state given in IEEE Std 802.11-2012 , Section L.1.5.2 and applies for S1G, VHT, HT, and Non-HT OFDM formats. For the DMG format, specifying ScramblerInitialization with wlanWaveformGenerator overrides the value specified by the wlanDMGConfig configuration object. For more information, see Scrambler Initialization. When specified as a scalar, the same scrambler initialization value is used to generate each packet for each user of a multipacket waveform. When specified as a matrix, each element represents an initial state of the scrambler for packets in the multipacket waveform generated for each user. Each column specifies the initial states for a single user, therefore up to four columns are supported. If a single column is provided, the same initial states are used for all users. Each row represents the initial state of each packet to generate. Therefore, a matrix with multiple rows enables you to use a different initial state per packet, where the first row contains the initial state of the first packet. If the number of packets to generate exceeds the number of rows of the matrix provided, the rows are looped internally. ScramblerInitialization is not valid for non-HT DSSS. Duration of the window transition applied to each OFDM symbol, specified in seconds as a nonnegative scalar. No windowing is applied if WindowTransitionTime = 0. The default and maximum value permitted is shown for the various formats, type of guard interval, and channel bandwidth. 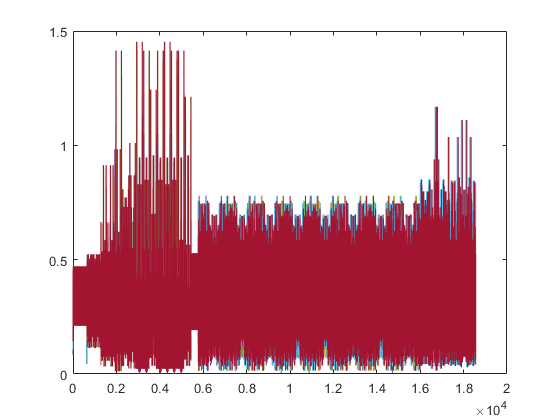 Packetized waveform, returned as an NS-by-NT matrix. 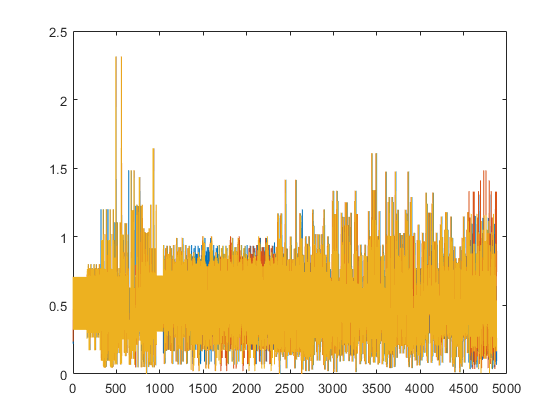 NS is the number of time-domain samples, and NT is the number of transmit antennas. waveform contains one or more packets of the same IEEE 802.11 PPDU Format. Each packet can contain different information bits. Waveform packet windowing is enabled by setting WindowTransitionTime > 0. Windowing is enabled by default. For more information, see Waveform Sampling Rate, OFDM Symbol Windowing, and Waveform Looping. Supported IEEE 802.11 PPDU formats defined for transmission include VHT, HT, non-HT, S1G, DMG, and HE. For all formats, the PPDU field structure includes preamble and data portions. For a detailed description of the packet structures for the various formats supported, see WLAN Packet Structure. At the output of wlanWaveformGenerator, the generated waveform has a sampling rate equal to the channel bandwidth. For all HE, VHT, HT, and non-HT format OFDM modulation, the channel bandwidth is configured via the ChannelBandwidth property of the format configuration object. For the DMG format modulation schemes, the channel bandwidth is always 2640 MHz and the channel spacing is always 2160 MHz These values are specified in IEEE 802.11ad™-2012 , Section 21.3.4 and Annex E-1, respectively. For the non-HT format DSSS modulation scheme, the chipping rate is always 11 MHz, as specified in IEEE 802.11-2012, Section 17.1.1. This table indicates the waveform sampling rates associated with standard channel spacing for each configuration format prior to filtering. For DMG, the channel bandwidth is fixed at 2640 MHz. FS is the OFDM sampling rate. FC is the chip rate for single carrier, control PHY, and DSSS/CCK modulations. 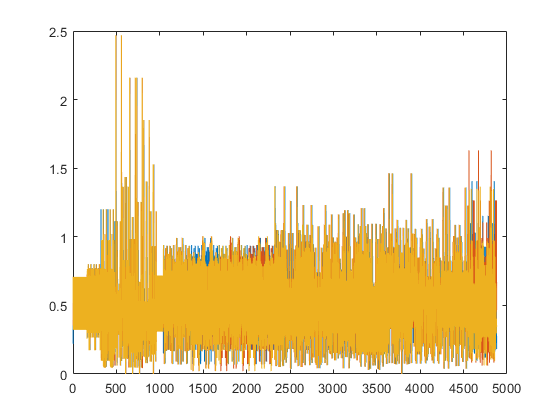 OFDM naturally lends itself to processing with Fourier transforms. A negative side effect of using an IFFT to process OFDM symbols is the resulting symbol-edge discontinuities. These discontinuities cause out-of-band emissions in the transition region between consecutive OFDM symbols. To smooth the discontinuity between symbols and reduce the intersymbol out-of-band emissions, you can use the wlanWaveformGenerator function to apply OFDM symbol windowing. To apply windowing, set WindowTransitionTime to greater than zero. When windowing is applied, transition regions are added to the leading and trailing edge of the OFDM symbol by the wlanWaveformGenerator. Windowing extends the length of the OFDM symbol by WindowTransitionTime (TTR). After windowing is applied to each symbol, pointwise addition is used to combine the overlapped regions between consecutive OFDM symbols. Specifically, the trailing shoulder samples at the end of OFDM symbol 1 (T – TTR/2 to T + TTR/2) are added to the leading shoulder samples at the beginning of OFDM symbol 2 (–TTR/2 to TTR/2). For DMG format, windowing is only applicable to packets transmitted using the OFDM PHY and is applied only to the OFDM modulated symbols. For OFDM PHY, only the header and data symbols are OFDM modulated. The preamble (STF and CEF) and the training fields are single carrier modulated and are not windowed. Similar to the out of band emissions experienced by consecutive OFDM symbols, as shown here the CEF and the first training subfield are subject to a nominal amount out of band emissions from the adjacent windowed OFDM symbol. For more information on how wlanWaveformGenerator handles windowing for the consecutive packet IdleTime and for the last waveform packet, see Waveform Looping. To produce a continuous input stream, you can have your code loop on a waveform from the last packet back to the first packet. Applying windowing to the last and first OFDM symbols of the generated waveform smooths the transition between the last and first packet of the waveform. When WindowTransitionTime is greater than zero, wlanWaveformGenerator applies OFDM Symbol Windowing. When looping a waveform, the last symbol of packet_N is followed by the first OFDM symbol of packet_1. If the waveform has only one packet, the waveform loops from the last OFDM symbol of the packet to the first OFDM symbol of the same packet. When windowing is applied to the last OFDM symbol of a packet and the first OFDM of the next packet, the idle time between the packets factors into the windowing applied. Specify the idle time using the IdleTime property of wlanWaveformGenerator. If IdleTime is zero, OFDM Symbol Windowing is applied as it would be for consecutive OFDM symbols within a packet. If the IdleTime is nonzero, the extended windowed portion of the first OFDM symbol in packet_1 (from –TTR/2 to 0–TS), is included at the end of the waveform. This extended windowed portion is applied for looping when computing the OFDM Symbol Windowing between the last OFDM symbol of packet_N and the first OFDM symbol of packet_1. TS is the sample time. The looping behavior for a waveform composed of DMG OFDM-PHY packets with no training subfields is similar to the general case outlined in Waveform Looping but the first symbol of the waveform (and each packet) is not windowed. If IdleTime is zero for the waveform, the windowed portion (from T to T + TTR/2) of the last data symbols is added to the start of the STF field. If IdleTime is non-zero for the waveform, the IdleTime is appended at the end of the windowed portion (after T + TTR/2) of the last OFDM symbol. When a waveform composed of DMG OFDM-PHY packets includes training subfields, no windowing is applied to the single carrier modulated symbols the end of the waveform. The last sample of the last training subfield is followed by the first STF sample of the first packet in the waveform. If IdleTime is zero for the waveform, there is no overlap. 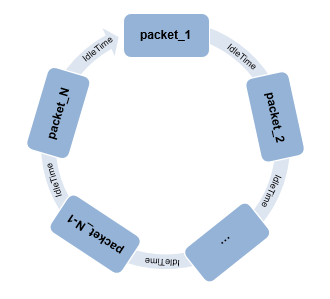 If IdleTime is nonzero for the waveform, the value specifies the delay between the last sample of packet_N and the first sample of in packet_1. When a waveform is composed of DMG-SC or DMG-Control PHY packets, the end of the waveform is single carrier modulated, so no windowing is applied to the last waveform symbol. The last sample of the last training subfield is followed by the first STF sample of the first packet in the waveform. The same looping behavior applies for a waveform composed of DMG OFDM-PHY packets with training subfields, DMG-SC PHY packets, or DMG-Control PHY packets. Conversion from integer to bits uses left-MSB orientation. For the initialization of the scrambler with decimal 1, the bits are mapped to the elements shown.